Ian Irvine's blog about his fantasy novels, kids' books, eco-thrillers, and the writing life. 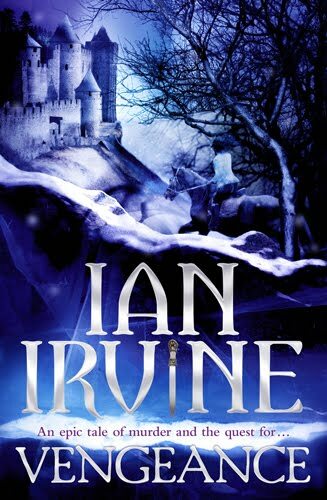 For all the latest news on my books and writing, and the world of fantasy in general, I've set up a new page, LATEST NEWS, on my gigantic website, www.ian-irvine.com. I'm updating the LATEST NEWS page almost every day with news, reviews, events, future plans and thoughts about the world of SF, the art of storytelling and the future of books. You can subscribe via RSS or email. See you there. 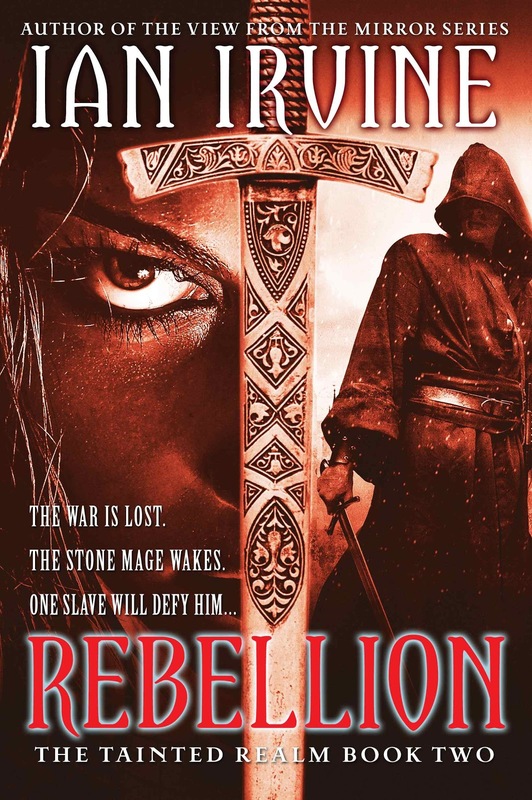 The first chapter of Rebellion, Book 2 of The Tainted Realm. I'll put it on my website with better formatting shortly, but in the meantime, here it is. Copyright © Ian Irvine, 2012. Rix’s right wrist throbbed abominably, and so did the back of his head. He groaned, rolled over and cracked his ear on a stone edge. His cheek and chest were numb, as if he’d been lying on ice. ‘What …?’ he mumbled. ‘Where –?’ His eyes were gummed shut and he didn’t want to open them. Didn’t want to see. He recognised her voice now. A maidservant, Glynnie. ‘And Lord Tobry’s been chucked off the tower, head-first. Splat!’ said a boy’s voice from behind Rix. ‘I’m sorry, Lord,’ said Glynnie. ‘R-Rixium?’ She tugged at his arm, the good one. Glynnie rubbed his eyelids with her fingertips. The sticky secretions parted to reveal a slender servant girl, seventeen years old. Tangled masses of flame-coloured hair, dark green eyes and a scatter of freckles on her nose. Rix had not yet turned twenty yet he felt a lifetime older. Foul and corrupt. They were on the top of his tower, at the rear of what remained of Palace Ricinus. From where Rix lay he could not see over the surrounding wall, and did not want to. Did not want to see the ruin a hundred-foot fall had done to his dearest friend. A freezing wind carried the stink of burned deer meat, the forgotten skewers Glynnie had been cooking over the embers of Rix’s artist’s easel. He would never paint again. Beside the fire stood a wide-eyed boy of ten, her little brother. A metal drinking cup sat on the stone floor. Some distance away lay a bloody sword. And a small puddle of blood, already frozen over. And a right hand, severed at the wrist. Something collapsed with a thundering crash not far away, and the tower shook. ‘What was that?’ said Rix. Her small head turned this way and that, surveying the great city. What was left of it. ‘As am I,’ said Rix. But he could see the light in her eyes as well, her absolute belief in him. It was an impossible burden for a condemned man and he had to strike it down. Hightspall was lost; nothing could be done about it. She was stronger than she looked, but Rix was a huge man and it was a struggle for her to raise him to his feet. The moment he stood upright it felt as though his head was going to crack open. Through a haze of pain and dizziness he heard someone shouting orders. ‘Search the rear towers next.’ The man had a heavy Cythonian accent. ‘Where are we going, Rix?’ said Glynnie. He swayed. She steadied him. That was ironic. A command spell cast on Rix when he was a boy of ten had left him with a deep-seated fear of magery, and recent events had proven his fear to be justified. Benn handed the ancient, wire-handled sword to Rix, who sheathed it left-handed. The roof door stood open. Glynnie helped him through it and onto the steep stair that wound down his tower. Rix swayed, threw out his right arm to steady himself and his bloody stump cracked against the wall. But few men had lost more than Rix. He’d been heir to the biggest fortune in the land, and now he had nothing. His family had been one of the noblest – for a few moments, House Ricinus had even been a member of the First Circle, the founding families of Hightspall. Then the chancellor, out of malice, had torn it all down. Rix’s parents had been hung from the front gates of the palace, then ritually disembowelled for high treason and murder, and everything they owned had been confiscated. Now, not even the most debased beggar or street girl was lower than the sole surviving member of House Ricinus. Rix had also been physically perfect – tall, handsome, immensely strong, yet dextrous and fleet – and accomplished. Not just a brilliant swordsman, but a masterful artist – the best of the new generation, the chancellor had said in happier times. Now Rix was maimed, tainted, useless. And soon to die, which was only right for a man so dishonourable that he had betrayed his own mother. As soon as Glynnie and Benn got away, he planned to take the only way out left to him – hurl himself at the enemy, sword in hand, and end it all. He reached the bottom of the tower stair, ignored Glynnie’s silent offer of help and lurched into his ruined studio. When Tobry had smashed the great heatstone in Rix’s chambers the other day, and it burst asunder, it had brought down several of the palace walls. There were cracks in the walls and part of the ceiling had fallen. The scattered paints, brushes and canvases were coated in grey dust. He crunched across chunks of plaster, stolidly looking ahead. He yearned for the solace of his art but had to put it behind him. Forever. ‘Where we going, Lord?’ Glynnie repeated. Not far away, sledge hammers thudded against stone and axes rang on timber. The Cythonians were breaking in and they would come straight here. He headed down the steps into his once-magnificent, six-sided salon, now filled with rubble, dust and smashed, charred furniture. The crashing was louder here. The enemy would soon break through. The only hope of escape, and that a feeble one, was to go underground. He still had coin, at least. Rix filled a canvas money belt with gold and other small, precious items and buckled it on one-handed. He packed spare clothing into an oilskin bag to keep it dry, and put it, plus various other useful items, into a pack. The crashing grew louder, closer. Glynnie filled two another oilskin bags, packed two small packs and dressed herself and Benn in such warm clothes as would fit. She strapped on a knife the length of her forearm and collected the dusty food in the salon. Benn still held Rix’s severed hand in his own small, freckled hand. His wide grey eyes were fixed on Rix’s bloody stump. Benn caught Rix’s gaze, flushed and looked away. Rix gestured to a broad crack, low down in the wall at the back of the salon. The edges resembled bubbly melted cheese, the plaster and stonework etched away and stained in mottled greens and yellows. He hacked away the foamy muck to reveal fresh stone, though when he flicked the clinging stuff off the knife the blade was so corroded that it snapped. He tossed it into the rubble. Benn ran back and fetched him another knife. ‘What is that stuff?’ said Benn. ‘An alchymical fluid, the most dangerous in the world. Dissolves anything. Even stone, even metal – even the flesh of a ten-year-old boy.’ Rix took Benn’s free hand and helped him though. ‘We’ll need a lantern,’ said Glynnie. ‘No, they’d track us by its smell,’ said Rix. He handed the boy a glowstone disc, though its light was so feeble it barely illuminated his arm. Tobry, an accomplished magian, could have coaxed more light from it, but – Rix avoided the rest of the thought. ‘We’ll need more light than that,’ said Glynnie. She bundled some pieces of wood together from a broken chair, tied them together with strips of fabric, tied on more fabric at one end and shoved it in her pack. They went through, holding their breath. The crack snaked ever down, shortly intersecting a network of other cracks that appeared to have freshly opened, and might close again just as suddenly. ‘If they shut, they’ll squeeze the juice out of us like a turnip,’ whispered Glynnie. Stink-damp smelled like rotten eggs. The deadly vapour seeped up from deep underground and collected in caverns, from where it was piped to the street lamps of Caulderon and the great houses, such as Palace Ricinus. Stink-damp was heavier than air, however. It settled in sumps, basements and other low places, and sometimes exploded. ‘I can smell alkoyl,’ said Benn. Benn sniffed the air and moved down the crack. ‘Why are we following alkoyl?’ said Glynnie. The boast was hollow. Down here, Rix’s size put him at a disadvantage, whereas Wil could hide in any crevice and reach out to a naked throat with those powerful strangler’s hands. They squeezed down cracks so narrow that Rix could not take a full breath, under a tilted slab of stone that quivered at the touch, then through an oval stonework pipe coated with feathery mould. Dust tickled the back of Rix’s throat; he suppressed a sneeze. After half an hour, Benn could no longer smell alkoyl. Neither Glynnie nor Benn answered. They were at the intersection of two low passages that burrowed like rat holes through native rock. Many tunnels were known to run under the palace and the ancient city of Caulderon, some dating back thousands of years to when it had been the enemy’s royal city, Lucidand; others had been forgotten long ago. Rix’s wrist, which had struck many obstacles in the dark, was oozing blood and throbbing mercilessly. An angry retort sprang to his lips, but he did not utter it. He had been about to scathe Glynnie the way his late mother, Lady Ricinus, had crushed any servant with the temerity to speak back to her. Yet Rix was forsworn and a condemned man, while Glynnie had never done other than to serve as best she could. She was the worthy one; he should be serving her. It took another half hour of creeping and crawling before they found somewhere safe, a vault excavated from the bedrock. It must have dated back to ancient times, judging by the stonework and the crumbling wall carvings. A second stone door stood half open on the other side, its hinges frozen with rust. To the left, water seeped from a crack into a basin carved into the wall, its overflow leaving orange streaks down the stone. ‘I don’t like this place,’ said Benn, huddling on a dusty stone bench, one of two. In the far right corner a pile of ash was scattered with wood charcoal and pieces of burnt bone, as if someone had cooked meat there and tossed the bones on the fire afterwards. ‘I can do everything.’ It was a statement, not a boast. Gingerly, as though she would have preferred not to touch it, she pressed Maloch’s hilt into Rix’s left hand. She knelt in the dust before him, then took a bottle of priceless brandy from her pack, Rix’s last surviving bottle, and rinsed her hands with it. She laid a little bundle containing rags, needle and thread and scissors on her pack, poured a slug of brandy onto a piece of linen and began to clean his stump. Rix tried not to groan. Blood began to drip from several places. By the time she finished, Glynnie was red to the elbows. He leaned back against the wall and closed his eyes, for once content to do as he was told. ‘Hold his wrist steady, Benn,’ said Glynnie. A pair of smaller, colder hands took hold of Rix’s lower arm. He heard Glynnie moving about but did not open his eyes. She began to tear linen into strips. Liquid gurgled and he caught a whiff of the brandy, then a chink as she set down a metal cup. ‘I could do with a drop of that,’ he murmured. Glynnie gave a disapproving sniff. She was washing her hands again. She began to spread something over his stump, an unguent that stung worse than the brandy. Rix’s fingers clenched around Maloch’s hilt. Her hand steadied his wrist. There came a gentle, painful pressure on the stump. Where his fingers touched the hilt, they tingled like a nettle sting. Then Rix felt a burning pain as though she had poured brandy over his stump and set it alight. His eyes sprang open. Glynnie had pressed his severed hand against the stump, and now the pain was running up his arm and down into his fingers. Blue were-flames flickered around the amputation then, with the most shocking pain Rix had ever experienced, the bones of his severed hand ground against his wrist bones – and seemed to fuse. He had the good sense not to move, though he could not hold back the agony. It burst out in a bellow that sifted dust down from the roof onto them, like a million tiny drops falling through a sunbeam. It's been ages since I last had a guest post here. Damned deadlines! Today I'm especially pleased to be talking to DC Green, children's author, surf journalist (he's written more than 2,000 non-fiction articles) and all-round cool (not to mention exceptionally funny) guy. In the fictional world, DC is best known for his humorous children's trilogy about the boy genius Erasmus James – the boy who doomed the universe! – and all manner of gross, foul and disgusting friends and enemies – to say nothing of mutant chooks! Take it away, DC. Welcome to Stop Two of the DC Green Grat Siege Blog Blitz Tour! Ian: Hi, DC. Tell us about your new book, Erasmus James and the Grat Siege. Grats! Giant rats!! – surround my castle. My troops defend bravely. My mates – mutant chooks, ninja horses and grommets – are also out-numbered, starving and stinky. Grins dripping blood, they turn to me for inspiration. To Erasmus James, the boy who doomed the universe! Ian: That sounds evilly exciting! This is the third Erasmus James book. Do readers need to have read the first two books in the series? DC: No. All the books in the series have standalone stories. Relevant details that happened in earlier books are always explained. Having said that, for the most satisfying reading experience, I’d recommend reading all three books in one big, demented readathon. That will also be satisfying for my bank account! Ian: Good one, DC. Money – can't do anything with it, can't do without it. What inspired you to write Erasmus James and the Grat Siege? 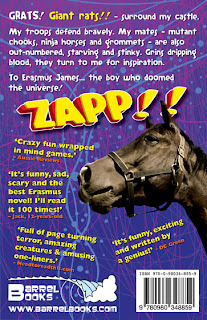 DC: It’s such a buzz writing the character of Erasmus James (or Raz for short). All three novels in the series are written in Raz’s first person voice. He loves playing with language, making puns, cracking jokes and insulting other characters – all of which is a LOT of fun to write – and hopefully, to read! Raz also makes disastrous decisions, which makes for interesting plots. In ‘Erasmus James, King of Kid’sParadise’, Raz becomes the king of a tropical island. The power definitely goes to his curly head as he orders his subjects to smooth his beaches with toothbrushes! Raz is horrified when his subjects rebel – and even more horrified when he learns they are all due to be eaten by giant rats when they turn 16! Raz evacuates everyone off the island, but leaves behind his dad’s galactic zapp machine. So in Grat Siege, I was eager to see how Raz would face the consequences of his blunders. Could he become a true leader and not just a power-crazed king? 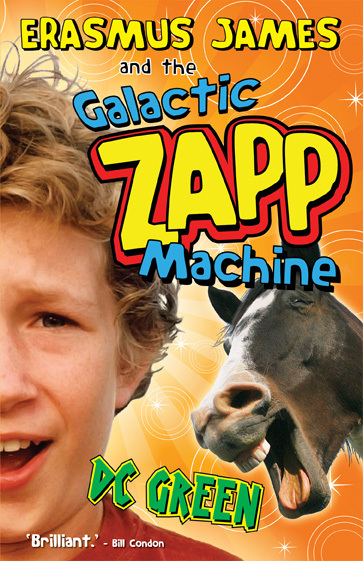 I also was keen to reveal the amazing secret behind the galactic zapp machine, to learn the fates of my favourite characters from the first two books and to write about an IMAGINATION WAR! Ian: My daughter used to have pet rats so I know all about their villainous habits. That sounds even more exciting! What inspired you to make a siege the central element of your story? DC: When I was a boy, I read and DEVOURED The Lord of the Rings! I was always especially fascinated by the second book in Tolkein’s trilogy, which features the siege of Helm’s Deep. A siege, of course, is a situation where a small army is surrounded in a castle or a fort by a much larger army. The large army hopes to starve the small army into surrendering. As much as I loved The Lord of the Rings, I always thought more could be done with the siege scenario. The best stories are all about conflict, and a siege is surely the ultimate in conflict! 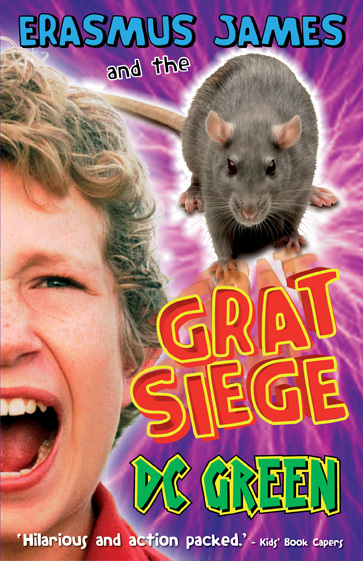 In Grat Siege, the Golden castle is encircled by a massive army of giant rats – and yes, they do attack! Often!! Behind the castle walls, food, water and ammunition all run dangerously low. The tension rises as characters argue and squabble. Should they surrender? Should they go on the attack? Should they eat the intelligent chickens and rats? Should they just go CRAZY? All these questions and more will hopefully be answered! Ian: I loved The Lord of the Rings too. In fact, one of the reasons I started writing was that I couldn't find more epic fantasy like it. What inspires you to write? DC: I simply love writing! It’s as important to me as eating, breathing or surfing. I’m also continually inspired when I perform school shows around Australia. I feel fantastic when a student approaches me after one of my shows and says something like, ‘Your book is the first book I’ve ever been able to finish, DC. And I’ve finished it seven times!’ or when a teacher emails me to say that the standard of creative writing has gone through the roof after my author visit. Hopefully, my visit contributed! Ian: I'm sure it did, and of of the greatest things about writing adventure for kids is knowing that one has helped to encourage a love of reading. How do you come up with story ideas? DC: I mix ingredients! I’ll give you an example. My stepson’s favourite stories always featured either superheroes or ‘gross stuff.’ So I decided to mix those elements together and ended up with Stinky Squad: a team of gross superheroes whose powers include wall-melting farts, acid vomit, reality-warping burps and super-sticky pimple pus! Next I added the most important ingredient for any story: conflict! In the case of Stinky Squad, that meant a rival team of mutant teens, an evil prime minister and 20 million brain-eating zombies! I also find story ideas through the creation of interesting characters or worlds, from my own life, or through non-fiction sources such as newspapers or science articles. 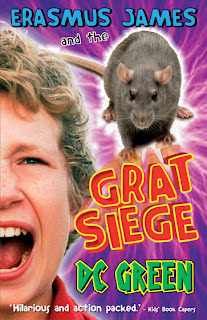 Ian: Reviews of Grat Siege? Superlative praise? Tell us about it. – Dee White, Kids’ Book Capers. Ian: Great reviews, DC! Bizarre bodily functions – we can't have too much of them. Thanks for dropping by – and all the very best for Grat Siege. I hope you sell a million. DC: Thanks for hosting me, Ian! I’m stoked to return the favour. Besides being the first author I ever hosted on my blog, your Grim and Grimmer Quartet is the epitome of unrelenting conflict and I’ve been a huge fan of your Three Worlds books for many years. Ian: Thank you for telling me. I'm thinking about the next book in the series right now. The DC Green Grat Siege Blog Blitz Tour Itinerary! Topic 1: Blog Tour Mania! Topic 7: Plotting and Planning! For the record, here are the winners of my third book giveaway on Goodreads, which ended on March 3, 2012. I gave away 3 copies of the Australian trade paperback edition of Vengeance, and Australian and NZ readers were eligible to enter. Winners are chosen randomly by Goodreads. The winners will be sent their books shortly. US, UK, Canadian and other international readers, don't despair. I'll be running giveaways for you on Goodreads later in the year. Over the past five weeks I've been running a competition on my Facebook author page, http://www.facebook.com/ianirvine.author where the prize is an Apple iPad 3 16G Wi-Fi. The competition was open to Australians only (for legal reasons – such competitions are illegal in some countries) and was run under NSW government permit LTPS/12/01180. The competition rules can be found here: http://www.facebook.com/ianirvine.author?sk=app_139229522811253. There were 1693 entries. Here's how it was judged. I downloaded all the entries into a spreadsheet, deleted 18 invalid entries (ie those not from Australia), deleted my own test entry, and ended up with 1,674 valid entries, numbered from 1 to 1674. I then obtained a random number sequence from 1 to 1674 using the Sequence Generator at www.random.org. The first number in the sequence is the winner. And the winner is John Ryan, who has been notified. Congratulations, John. Commiserations to everyone else. But never fear, I'll have more competitions running shortly at http://www.facebook.com/ianirvine.author. For the record, here are the winners of my second book giveaway on Goodreads, which ended in early February 2012. 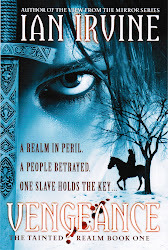 I gave away 3 copies of the Australian trade paperback edition of Vengeance, and Australian and NZ readers were eligible to enter. Winners are chosen randomly by Goodreads. The winners were sent their books in mid-February 2012. 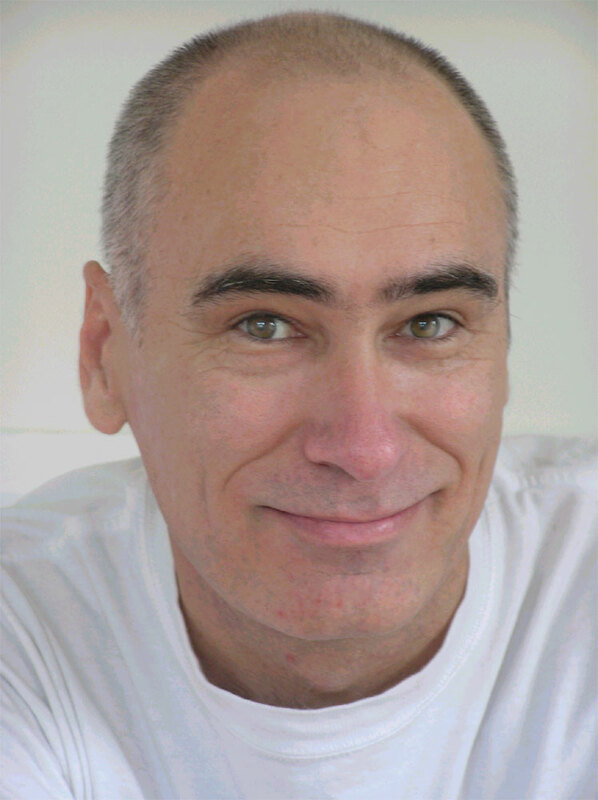 I'm an Aussie novelist, as well as a marine scientist who has developed some of Australia's national guidelines for protection of the oceanic environment. My 28 novels include the international bestselling 11-book Three Worlds fantasy sequence, a trilogy of thrillers about catastrophic climate change, and 12 books for children. 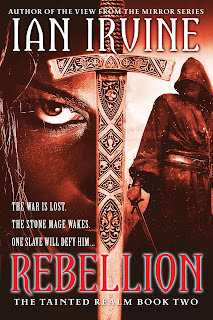 My latest book is Rebellion, Book 2 of a new epic fantasy trilogy The Tainted Realm. © Ian Irvine, 2011. Articles, © their creators. Frog photo © Elle Irvine, assisted by Anne. Simple theme. Powered by Blogger.